Two of these meetings are replicated in the Championship this season – West Brom hosted Stoke last Saturday (1st September), while Bolton welcome Derby later this month (29th) in a re-match of their nine-goal encounter on the Football League’s opening day. Aston Villa v Everton remains the most frequently played English league fixture, despite Villa’s relegation from the top division in 2016. Preston will celebrate 130 years of League football at their Deepdale ground on the 15th September, followed by Burnley at Turf Moor later in the month. Liverpool, who entered the Football League in 1893, marked their 125th anniversary at Anfield last year, though the ground was first used by Everton, from the opening round of fixtures in 1888. Owing to the varying kick-off times, the first League goal has been the subject of contention over the years, and was credited as an own goal by the unfortunate Aston Villa defender Gershom Cox for more than a century. 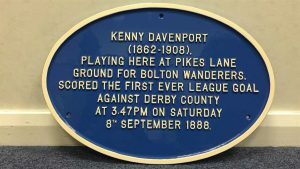 After extensive research by football historian Mark Metcalf, it is now established that it was scored by James Kenyon ‘Kenny’ Davenport, for Bolton Wanderers at their Pikes Lane ground, two minutes into the match against Derby County. 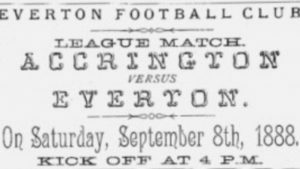 The highest attendance on the 8th September was believed to be approximately 10,000 at Everton’s recently refurbished Anfield ground, where they entertained Accrington. Pikes Lane, Bolton, is pictured in the header of this blog, during an early league fixture c. 1888. Bolton Wanderers played there from 1880 until 1895, when they moved to Burnden Park. Although the site is now terraced housing, a blue plaque commemorates Davenport’s historic goal.